← Why poverty and why hunger? Is the International Criminal Court targeting Africa? 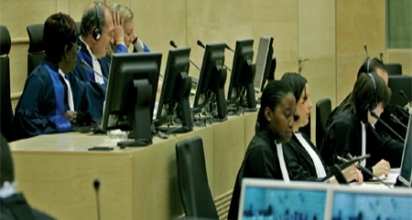 A legal officer with the International Criminal Court (ICC) Fadi El Abdallah has denied that the world court has concentrated the bulk of its investigations and operations on the African continent. Recent critiques from a variety of sources, including the African Union, have charged the ICC with jeopardising peace, prolonging ethnic conflict and threatening the national sovereignty of African states. This so called bias on the part of the ICC has left the world court battling to gain credibility but Fadi El Abdallah, says “the situations of four continents are under analysis by the Office of the Prosecutor: Afghanistan, Colombia, the Republic of Korea, Georgia, Guinea, Honduras, Nigeria and Palestine,” so the court cannot be said to be bias. AfricaNews: How do you (ICC) start your investigations, do you need a permission of authorities of particular country to be able start investigations? Fadi: Any State Party to the Rome Statute can request the Prosecutor to carry out an investigation. A State not party to the Statute can also accept the jurisdiction of the ICC with respect to crimes committed in its territory or by one of its nationals, and request the Prosecutor to carry out an investigation. The United Nations Security Council may also refer a situation to the Court. The Prosecutor determines whether, in his opinion, the Court has jurisdiction with respect to the alleged crimes. Following a thorough analysis of the available information, he decides whether there is a reasonable basis to proceed with an investigation. Thus, he must establish whether the crime of genocide, crimes against humanity or war crimes may have been committed and, if so, whether they were committed after 1 July 2002. The Prosecutor must also ascertain whether any national authorities are conducting a genuine investigation or trial of the alleged perpetrators of the crimes. Lastly, he must notify the States Parties and other States which may have jurisdiction of his intention to initiate an investigation. Also, if the Office of the Prosecutor receives reliable information about crimes involving nationals of a State Party or of a State which has accepted the jurisdiction of the ICC, or about crimes committed in the territory of such a State, and concludes that there is a reasonable basis to proceed with an investigation. Such information can be provided by individuals, intergovernmental or non-governmental organisations, or any other reliable sources. The Prosecutor must, however, obtain the permission of the judges of the Pre-Trial Chamber before initiating an investigation under such circumstances. AfricaNews: Is there an international definition of what constitutes crime? Is it fixed or democratically dynamic? Fadi:The mandate of the Court is to try individuals rather than States, and to hold such persons accountable for the most serious crimes of concern to the international community as a whole, namely the crime of genocide, war crimes, crimes against humanity, and the crime of aggression, when the conditions for the exercise of the Court’s jurisdiction over the latter are fulfilled. These crimes are defined in the international treaty founding the ICC, called the Rome Statute, and in the legal text titled “Elements of Crimes” also approved by the States. Only the States Parties to the Rome Statute can amend these legal texts. AfricaNews: What is the threshold for how serious a crime must be before investigations can commence? Fadi:The gravity of crimes is one of the criteria that the Prosecutor examines in order to evaluate whether or not there is a reasonable basis to open an investigation. However, the gravity criteria is not defined only by the number of persons killed, but also by the impact of the crimes on victims, which can be measured only a case-by-case basis, under the final control of the judges. AfricaNews: Does the ICC give militant groups or territories the authorisation to become signatories? Fadi:No, only States can be parties to the Rome Statute, the treaty founding the ICC. However, all armed groups participating in an armed conflict have to comply with the rules of international law. AfricaNews: Aside the trial of war crimes in theYugoslavia war, the ICC has most cases and investigations in Africa (Sudan, Kenya, Cote D’Ivore, Libya, Nigeria, Rwanda). Why is this? Fadi:The ICC is concerned with countries that have accepted the Court’s jurisdiction and these are in all continents, including Africa. Three of the six situations currently under investigation were referred by African states themselves. Between 2003 and 2005, the Democratic Republic of the Congo, Uganda, and the Central African Republic referred situations in their own territory to the ICC. The situations in Darfur and in Libya were referred by the United Nations Security Council by two resolutions under Chapter VII of the UN Charter, as provided for by article 13 of the Rome Statute. Only the investigation in the situation in Kenya has been initiated by the ICC Prosecutor. Lastly, situations in countries on four continents are under analysis by the Office of the Prosecutor: Afghanistan, Colombia, the Republic of Korea, Georgia, Guinea, Honduras, Nigeria and Palestine. AfricaNews: What is your take on people’s claim that the court is set-up for Africa? Fadi: TheInternational Criminal Court is an independent judicial institution that it is not subject to political control. As an independent court, its decisions are based on legal criteria and rendered by impartial judges in accordance with the provisions of its founding treaty, the Rome Statute, and other legal texts governing the work of the Court. African countries made great contributions to the establishment of the Court and influenced the decision to have an independent Office of the Prosecutor. In 1997, the Southern African Development Community (SADC) was very active in supporting the proposed Court and its declaration on the matter was endorsed in February 1998, by the participants of the African Conference meeting in Dakar, Senegal, through the “Declaration on the Establishment of the International Criminal Court”. At the Rome Conference itself, the most meaningful declarations about the Court were made by Africans. Without African support, the Rome Statute might never have been adopted. In fact, 43 African countries are currently signatories of the Rome Statute, of which 31 are parties to the Statute, making Africa the most heavily represented region in the Court’s membership. The trust and support comes not only from the governments, but also from civil society organisations. Fadi: The ICC has been established to put an end to the impunity of the perpetrators of the most serious crimes of concern to the international community as a whole. The fight against impunity is necessary to build a lasting peace, however it is clear that it is a long fight, and that the ICC counts on the cooperation of the States in order to implement the judges’ decisions. In establishing the ICC, the States set up a system based on two pillars. The Court itself is the judicial pillar. The operational pillar belongs to States, including the enforcement of Court’s orders. When the Court’s jurisdiction is triggered by the Security Council, the duty to cooperate extends to all UN Member States, regardless of whether or not they are a Party to the Statute. The crimes within the jurisdiction of the Court are the gravest crimes known to humanity and as provided for by article 29 of the Statute they shall not be subject to any statute of limitations. Warrants of arrest are lifetime orders and therefore individuals still at large will sooner or later face the Court. AfricaNews: Why bring the culprits to The Hague? Why can’t the ICC sit in the affected countries with their own prosecuting team and judges? Fadi: The States Parties to the Rome Statute decided to have the headquarters of the ICC in The Hague (the Netherlands). In order to make the best use of the limited human and material resources allocated to the ICC, it is necessary to centralize the large number of services required. However, the judges can decide to hold audiences in the affected countries if they deem it appropriate and in the interest of justice, and if the security and logistic conditions are fulfilled. AfricaNews: The trial of key Kenyan government officials involvement in the 2007 post-election violence is ongoing with this officials still in office wielding enormous political power. Is this fair on ordinary Kenyans? Fadi: The ICC judges imposed a certain number of conditions on the six Kenyan suspects to ensure that they will not put in danger, by any means, the proceedings or the security of witnesses. The Court is monitoring the implementation of these conditions. In case a suspect breaches the conditions imposed by the ICC judges, the Court may decide to issue a warrant of arrest against this person. Fadi: The ICC has no jurisdiction over Pakistan or Iraq. Neither of these countries is a State Party to the Rome Statute, and the situations in their territories have not been referred to the ICC by the United Nations Security Council. Afghanistan is a State Party to the Rome Statute, and the ICC Prosecutor is conducting a preliminary examination of the situation in this country. If he decides to open an investigation, the persons suspected of having committed crimes falling under the ICC’s jurisdiction can be prosecuted regardless of their nationality. AfricaNews: How effective or successful has the ICC been so far? Fadi: The International Criminal Court was established after the Rome Statute entered into force, on 1 July 2002. It is now a fully functional institution: 115 States are now parties to the Rome Statute, six investigations have been opened, eight preliminary examinations are conducted, 15 warrants of arrest and 9 summonses to appear have been issued by the judges, five persons are in the custody of the Court and four trials are ongoing, eight other cases are at the pre-trial stage and thousands of victims are participating in the different cases through their legal representatives. A lot of challenges are still ahead, but the Court is already an important element in the International Justice System by which the International Community responds to the world’s most serious crimes.